Gouache watercolor on heavyweight watercolor paper. 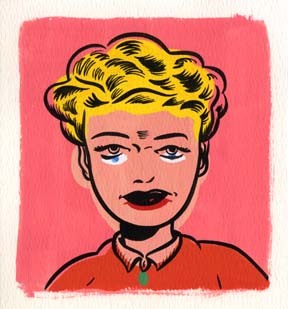 Painting is 4 3/4" x 4 3/4". Sandy Apple, "The Child Prodigy", major art crime: "Sandy Sparkles Suzie", featured the tinsel and glitter suffocation of her five year-old sister. <br><br> NOTE: This is part of my new painting series, Criminals of the Art World, currently showing at the Seattle non-profit, artist-run Sessions Gallery (<a href="http://sessionsgallery.com/" class="link" target="CACwin">sessionsgallery.com</a>). Also see the Seattle Weekly for a positive review of my paintings (<a href="http://www.seattleweekly.com/features/0548/051130_arts_comicartists.php" class="link" target="CACwin">here</a>).